LOUISVILLE, Ky. - Championship notes via the PGA of America. PGA club professional Brian Norman, a native of Henderson, Kentucky, hit the first tee shot in the 96th PGA Championship, Thursday at 7:30 a.m. off the No. 1 tee. Norman, 32, is a PGA assistant professional at The Lakes at Castle Hills in The Colony, Texas. Robert Karlsson of Sweden, who played for Europe in the 2008 Ryder Cup at Valhalla, was first off the 10th tee, at 7:35 a.m.
Groups in the morning wave teed off on No. 1 from 7:30 a.m. to 9:30 a.m., and off No. 10 from 7:35 a.m. to 9:35 a.m. In the afternoon wave, groups start on No. 1 from 12:40 p.m. to 2:40 p.m., and on No. 10 from 12:45 p.m. to 2:45 p.m.
Matt Kuchar has withdrawn from the championship due to an injured back. First alternate John Huh took Kuchar's spot in the field. 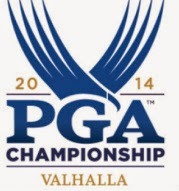 The prize money for the 2014 PGA Championship is $10 million, the highest of any major golf championship. The winner will receive $1.8 million. 66 was the low score after the first round in each of the first two PGA Championships played at Valhalla. Kentuckian Kenny Perry led after 18 holes in 1996, and Tiger Woods and Scott Dunlap shared the lead in 2000. Tiger Woods and Phil Mickelson have been paired 31 times on the PGA Tour. They made it 32 when they teed off with 2008 PGA Champion Padraig Harrington at 8:35 a.m. on No. 10. Weather forecast: Plenty of clouds over Valhalla Golf Club, which will keep temperatures in the low 80s. Expect isolated showers late on Thursday, with increasing rain showers early Friday morning. Thunderstorms will become likely by Friday afternoon and continue through Saturday.